Welcome to the Memorable Moments Studio! 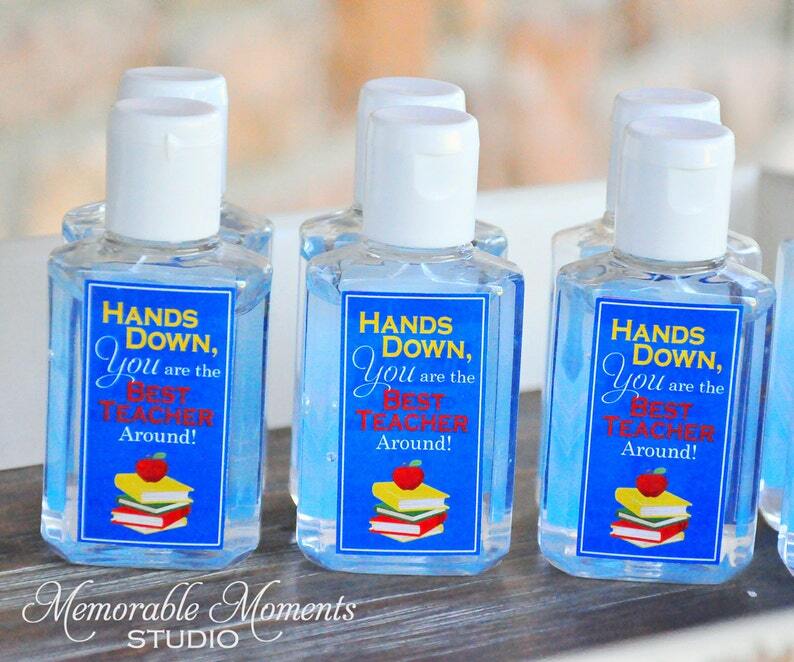 This listing includes a set of hand sanitizer labels which will be emailed to you in a PDF file format. The labels read "Hands Down the Best Teacher Around". PDF File will be sent instantly, once order is placed. To open the PDF file, you will need Adobe Reader (free download at adobe.com). Each labels is 1.2" wide by 2.25" tall. I recommend printing these on full sheet labels (that's one 8.5"x11" label per sheet), so they stick easily to the bottles. The products available from Memorable Moments are for PERSONAL USE ONLY. Memorable Moments retains all rights to these images. Please do not resell or duplicate my designs. Perfect, everyone that got a this valentine from a friend at work loved it! Love it! Too cute! Thanks! Label was cute and customized to fit my party. Seller was helpful and easy to work with. Since the items available in this shop are digital files and designs, refunds can not be issued once the file(s) are sent to the customer. Due to the nature of digital files, returns are not allowed. Instant download orders cannot be changed or canceled once submitted, because the files are immediately available for download once payment clears.